“How long do you spend doing school?” That’s probably one of the most common questions I hear. People who don’t homeschool usually assume it’s somewhere close to the length of an average public school day and are usually surprised when I tell them exactly how much free time we end up having each day. Basically, we finish up our school work in about half the time public school kids do. Just to be clear, my kids aren’t receiving half of their education. One thing people fail to consider is that in a classroom of 25 or more students, you have to allot time for all of those students to finish up each lesson before moving on to the next subject. Kids are basically forced into working at the pace of the slowest student in the class. With homeschooling, you finish your lesson for the day and you move on to the next thing. No waiting for everyone to finally catch up with you. No class bathroom breaks, no slow transitions to the next thing on the schedule….you just move on and get stuff done and very little time is wasted. One particular thing that has really helped us become super efficient with our time has been implementing the drawer system. I’ve done this almost from the very beginning. My kids have been learning how to work independently, whenever possible, for the last four years. I’m there to help if they should need me, but for the most part, they can both work through their daily tasks on their own. After they’ve both worked from top to bottom in their drawers, which typically takes around 2 1/2-3 hours, we cover the other subjects we do together. Depending on the day, that would include things like history, geography, poetry, etc. We wrap up with reading aloud nearly every single day. This “group work”, as we call it, takes about another hour. On a good day, it’s not uncommon for us to finish up around lunchtime, leaving the entire afternoon for leisurely reading, playing games, creative projects, being outside, and just enjoying childhood. And mind you, we are accomplishing a full week in four days, leaving the extra day open for their enrichment program where they have their “fun classes”. These kids are living the good life and they know it. We thank God every day for the freedom that homeschooling gives us! 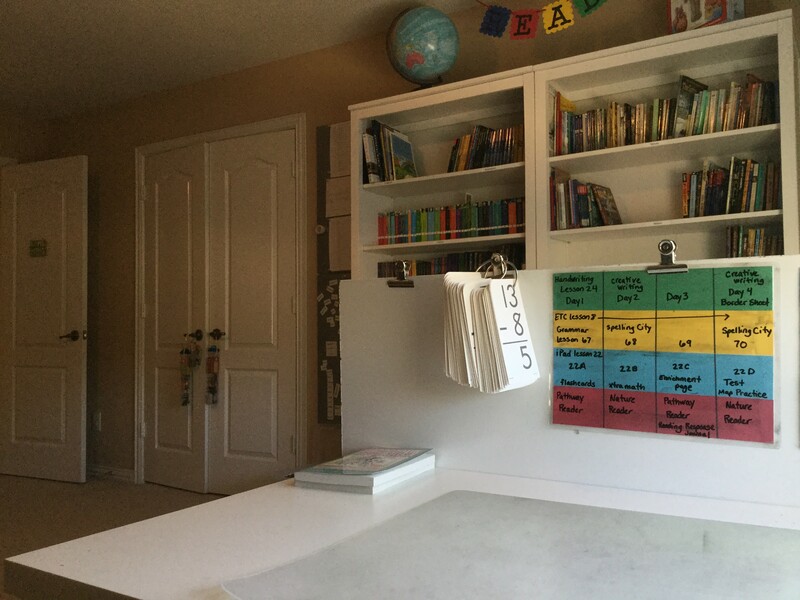 Here’s how I “post” the kids’ tasks so that they know what they’re doing. Each column is a school day and each color represents a drawer. They can see their entire week and even work ahead if they choose. 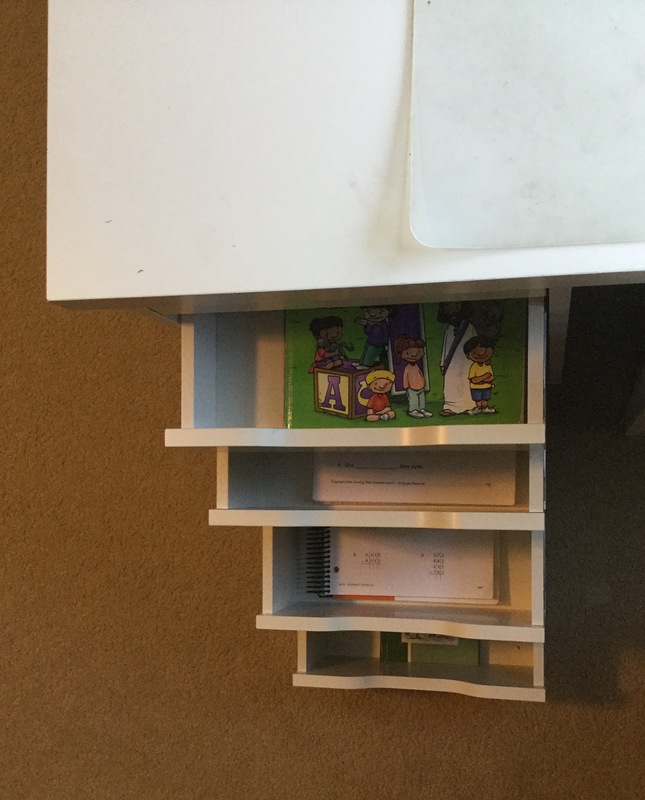 Our drawers are conveniently attached to our ikea desks (I’ve seen some people set up drawers in a separate location). On Sunday night, I make sure their drawers have all their materials so they’re set for the upcoming week. If you think my school room looks a bit empty, you’d be right. When I took these photos, my students had long since finished their work for the day and were enjoying an unseasonably warm afternoon outside.